Everybody loves an outlaw, at least from afar. Past generations hailed the lawlessness of Billy the Kid, Bonnie and Clyde, and the entire 1990s hip hop industry. Today, our merry pranksters have no face. They operate behind the glowing static of computer screens, from unknown locations. They are the hackers, or hacktivists, or bastards – whatever you want to call them. And right now, the dark spotlight shines on one name: Guccifer. For the sake of simplicity, we’ll refer to Guccifer as “him” or “he.” But the person behind a wave of hacks targeting Washington D.C. political elite and other high-profile individuals – from George H. W. Bush to venture capitalist John Doerr – could be the Queen of England, for all we know. Speaking of ‘all we know,’ here it is. 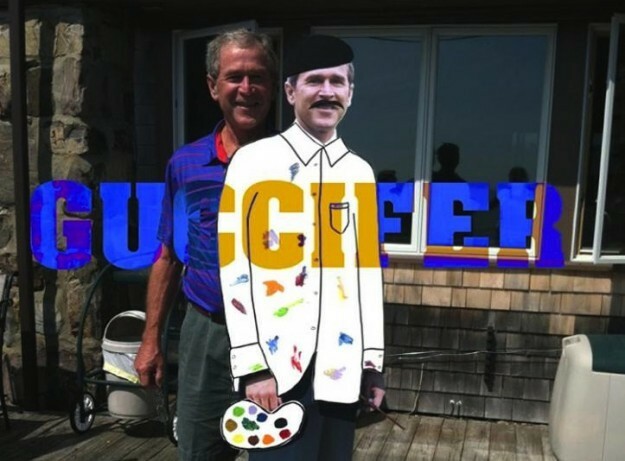 Guccifer first launched onto the top of the Web heap in early February, after leaking emails and photographs belonging to the Bush family to The Smoking Gun. The hacker told TSG that he had breached a total of six email addresses belonging to people close to two former U.S. presidents, including Dorothy Bush Koch, daughter of George H. W. Bush. In correspondence with TSG, Guccifer claimed to have a lot of “interesting” emails spanning from 2009 to 2012. But the most substantial thing to come out of the leak was a cache of photos showing paintings by George W. Bush, including a coy self-portrait of our 43rd president taking a shower. Guccifer would later go on to supply Gawker with many more of W’s paintings – a large portion of which are of dogs. The most sensitive item of the first Guccifer leak was a photo of 88-year-old George H.W. Bush in a hospital bed, during a short hospital stay in January. He also uncovered emails discussing possible funeral plans for the elder Bush. The FBI immediately launched an investigation into Guccifer following this initial release, but the hacker expressed something edging on indifference. Indeed. This would mark the beginning of Guccifer’s seemingly politically motivated hacking spree. U.S. Senator Lisa Murkowski (R-AK): Guccifer provided a screenshot that appears to prove his access to Sen. Murkowski’s Yahoo account, as well as her Flickr profile. According to a Murkowski spokesman, the Yahoo email account was only used to manage her Flickr account, and contained no sensitive data. U.N. Under-Secretary-General Joseph Verner Reed: A hacked AOL email account revealed “certain financial and travel records,” according to TSG. Reed also served as personal assistant to banker David Rockefeller. Guccifer claims to have accessed the email accounts of Happy Rockefeller, wife of former Vice President Nelson Rockefeller, and others in the Rockefeller family. Other victims reportedly include Rex Evitts, a military contractor working in Iraq; Susan Malone, an Army supervisor in Afghanistan (who is also a former FBI agent); and two unnamed former FBI agents. According to TSG, one of Guccifer’s victims whose IRA account was compromised discovered that the attack came from an IP address located in Russia. Of course, that tells us next to nothing – even the most amateur hacker will disguise his IP address by running it through a proxy server. A March 13 report from TSG reveals that Guccifer also accessed Powell’s AOL account, which provided access to emails about his financials and other personal matters. Guccifer also discovered correspondence with former Deputy Secretary of State Richard Armitage, ex-CIA Director George Tenet, and former U.S. ambassador to the United Nations, John Negroponte. 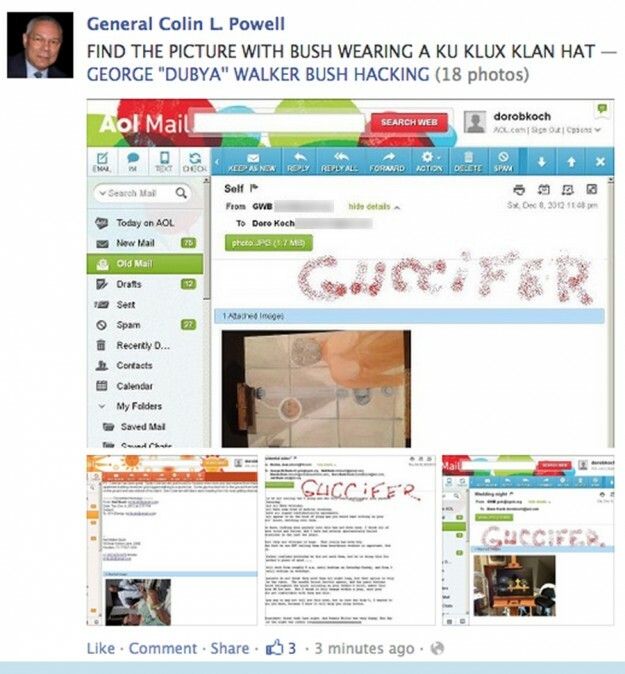 Just days after the Powell Facebook defacement, the TSG reported that Guccifer also gained access to the AOL email account of former President Bill Clinton’s White House advisor, Sidney Blumenthal. “By breaching Blumenthal’s account, ‘Guccifer’ was able to access his correspondence (dating back to at least 2005) with an array of Washington insiders, including political operatives, journalists, and government officials,” wrote TSG. Chief among Guccifer’s findings were correspondence with Hillary Clinton, including “foreign policy and intelligence memos” written during Mrs. Clinton’s recent tenure as Secretary of State. Over the weekend of March 16 and 17, Guccifer blasted “hundreds of recipients,” according to TSG, with a handful of memos sent between Hillary Clinton and Blumenthal over the past five months. One of these memos concerned the contentious September 11, 2012 attack on the U.S. embassy in Benghazi, Libya. 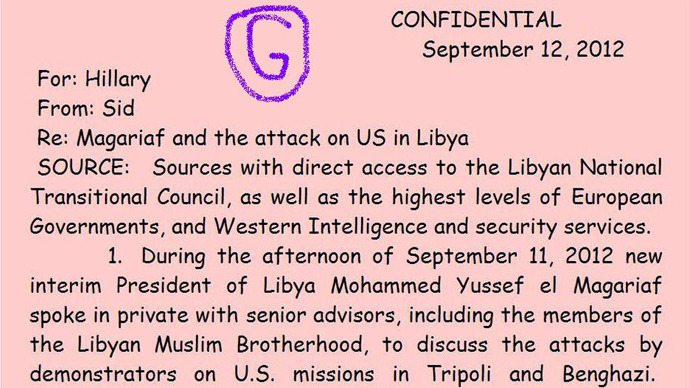 To add a bit of humor to his shenanigans, Guccifer reformatted the memos to appear in the universally hated Comic Sans font, with a pink background. The full Benghazi memos were published on March 20 by Russia Today, or RT, one of two dozen Russian news outlets that received the Guccifer memo blast. Other publications included Pravda, the Moscow Times, and The St. Petersburg Times, according to TSG. Guccifer reportedly used the email address owned by the wife of an unnamed Hollywood actor to send out the memos – another indication of how he hides his identity from the public and law enforcement. Just before leaking the second batch of Clinton emails, Guccifer added famed venture capitalist and Google board member John Doerr to his long list of wealthy and powerful victims. Guccifer used Doerr’s account to send emails to – you guessed it – The Smoking Gun. The latest Guccifer leak to date, release on March 25, is perhaps the most interesting. An email snatched from the coffers of Colin Powell’s AOL account and passed on to RT links former U.K. Prime Minister Tony Blair with the annual – and highly secretive – meeting of powerful men at California’s Bohemian Grove. The email in question comes from Andrew Knight, a former journalist and current executive at Rupert Murdoch’s News Corp, in which Knight tells Powell that “that Tony has not yet got his priorities straight,” after Blair did not commit to attending the Bohemian retreat. The Knight email is the best evidence that Blair did indeed attend the Bohemian Grove meetup, attendees of which are all male, and all-powerful – think presidents and former presidents, military contractors, oil barrons, the leaders of companies like IBM, and countless others. In other words, the meeting at Bohemian Grove is precisely the kind of “illuminati” stronghold Guccifer seems hellbent on exposing. And who knows, maybe he will. T-Mobile's LTE network is faster than Verizon's right now, but how long will that last?